What’s the difference between theirs and their’s? 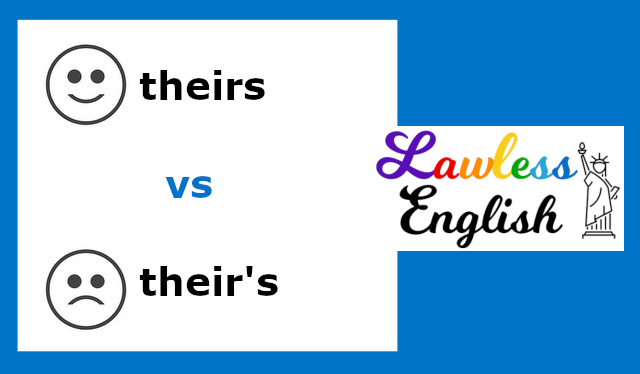 Theirs is the third person plural possessive pronoun – it replaces "their" + noun. He found a book – is it theirs? I can’t find my keys, but theirs are on the table. Theirs is a better idea. Though you may see their’s written even by native speakers, it is incorrect. Theirs should never have an apostrophe. The idea that theirs needs an apostrophe comes out of the fact that on virtually every other word, ‘s indicates possession, so English speakers sometimes think theirs should be spelled their’s. However, this is always incorrect – theirs is the only correct spelling. This is not exactly true, the current spelling of theirs comes from middle english their’s. The comment still doesn’t answer WHY? If all other possessive words use an apostrophe then why is it wrong or incorrect to do add it on this single word? What is the rule? What is the reason? I can’t answer that. Sometimes grammar just is. Why do we say “I walk, you walk, we walk, they walk” but “he walks”? That’s just the way the grammar evolved. In the case of possessives, “their’s” simply is not a word. It’s wrong. Actually, I was always taught “theirs” and “their’s” are BOTH wrong. as “their” in itself is possessive. 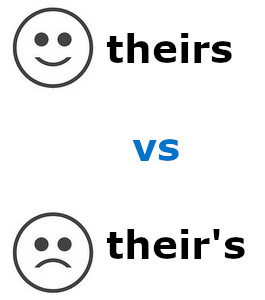 No, “their” is a possessive adjective, while “theirs” is a possessive pronoun. You could make the argument for your example, but what about this one? Thank you for helping me on this. I’m sure I’ll be back often.